Gerald Cotten and the $ 190 million lost? Recently, the imminent closure of the largest Canadian exchange of cryptocurrencies, QuadrigaCX, was announced by means of a communiqué on January 31, 2019 on its platform, which made it clear that it accepted the protection of creditors according to the laws of the District of Columbia, Canada to protect user funds. Hours later, the story of rumors was confirmed; another Canadian cryptocurrency exchange had the same fate as MapleChange, its closure for bankruptcy. QuadrigaCX was founded in mid 2013 by Gerald Cotten, a philanthropist of Bitcoin technology who worked for eleven years in Digital Currency and was certified as a Bitcoin professional by the Crypto Currency Certification Consortium in September 2014. During his brief stay, he appeared in technical forums, such as the Canadian Institute's Payment Forum on February 25, 2015 and was also an advisor to the Crypto Consortium, the regulatory body responsible for the creation of the C4 certification accredited to him. Since December 2013, he was a member of the Bitcoin Foundation and Director of the Bitcoin Cooperative in Vancouver, where he resided since then. This former student of the Business School of the University of New York in 2010, was widely known in the Canadian media for his contribution to innovation in traditional payment systems and other technical collaborations. However, despite having gained traction with the company founded and directing, QuadrigaCX; the reality of the financial problems of the platform seems to be another, as the information reviewed by the Canadian television CNBC, of ​​the freezing of funds for about $ 20 million dollars at the beginning of the year by the bank CIBC due to liquidity problems. This caused delays in the withdrawals of cryptocurrencies by customers, about 115 thousand users who saw their funds were restricted and to date without a visible picture of being able to be recovered. Cotten, according to his widow, died in India from complications of Crohn's disease. He was 30 years old and was in the process of founding an Indian orphanage. Rumors through various networks claim that the body was not repatriated intact and, instead, was cremated in Jaipur, India. According to a publication on the Reddit social network almost 3 weeks ago, in response to a question where the body of Cotten is, a supposed close family member has downloaded it against the user indicating that the funeral arrangements were made in private for the family and demanded respect. for the pain of others. However, there are no official documents of the Indian government shown to refute the repatriation of Cotten's body, which has led to more speculation of the possible fraud committed by the founder of the exchange and his widow wife. To make matters worse, the death of Cotten was announced in a message published by the company on its website and its Facebook. But The Globe and Mail newspaper reported that the businessman had signed a will on November 27, 2018, just two weeks before his death. In this document, Cotten names his wife as heir and executor, but did not give details on how to access the funds of QuadrigaCX in case of death, which generates more suspicions among users of a simulated death. Also on a page dedicated to the exchange on Reddit, I carry a publication concerned about employees who used false names. "The founders of QuadrigaCX and their fake names? "The entry in the social network is read. The theory that the two new drivers for the company, Michael Patryn and Lovie Horner are the same Gerald Cotten and his wife with new legal names, has gained momentum in recent days, especially by a burning accusation by Jesse Powell your official Twitter account about funds moved from the QuadrigaCX wallet to Kraken. 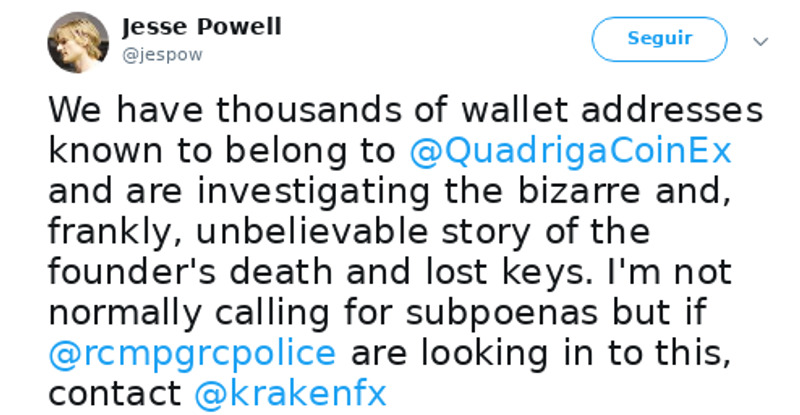 To make matters worse, in another publication it is alleged that cold wallet addresses of Litecoin QuadrigaCX were found where the funds are being withdrawn, so they assume that the lost keys is not quite true and someone or some are playing with the funds of the users. For now, QuadrigaCX said it hired an investigator to see if it could recover the information. But the efforts so far have had limited success in recovering a few coins, as well as some information contained in Gerald Cotten's computer and personal telephone. In a statement released last Thursday, QuadrigaCX said it was working to deal with "liquidity issues" that include efforts to locate and access its cryptocurrency reserve. As part of achieving transparency in the procedures, an independent auditor like Ernst and Young was hired but according to statements made by important means, there would be a conversation to sell the assets of the exchange as an effort to satisfy the debts. However, an important crypto medium has indicated that there may not be such cryptocurrencies to talk about, so it would be a useless distraction combined with suspicions about the founding of QuadrigaCX, that everything is a well-thought out exit scam. .
For now, if the history of QuadrigaCX is correct, they should publish the directions of their cold storage, if they can not do this, their history is not credible and is a scam like never before seen in the history of cryptocurrencies.